We have a lot to thank Bill Ruger for. He was an innovator, and his products still reign today in the shooting sports with a wide variety of handguns and rifles. Although Mr. Ruger has passed on, his legacy and company have thrived through new inventions, manufacturing techniques and a staff of personnel aiming for the future. One of its new products is the Ruger LCRx revolver. While this particular revolver comes from a lineup of various hammerless models, it is the first of the series with an exposed hammer, allowing a single-action trigger pull. While the non-hammer LCR is chambered in .22 LR, .22 WMRF, .38 Special +P, 9mm Luger and .357 Magnum—with and without Crimson Trace Lasergrips—the Ruger LCRx is currently chambered only in .38 Special +P. The LCRx has an external hammer, which the original didn’t. The gutter rear sight isn’t the greatest for precision, but if you want more, there’s an adjustable-sight version as well. At less than a pound, the gun combines a polymer lower housing containing the fire control mechanism; an aluminum alloy upper frame; and a stainless steel cylinder, firing pin bushing, trigger and barrel liner. Finished in a rich blue-black exterior, it’s amazing how components of differing materials can match so well. Ruger engineers molded the top of the frame with a gradual taper from the muzzle back to the rear gutter sight, which sits so low on the frame it’s hard to use at anything beyond point-blank range. Seems the best bet is to place the top of the hammer at the bottom of the rear sight and go for it. Fortunately, the front sight is pinned and can be replaced, and I’m sure the aftermarket people are going to offer high-visibility replacements. Plus, there’s the adjustable-sight version, which might suit some people better. The five-shot stainless steel cylinder is strong but slim, and the barrel lug/ejector shroud is radiused at the front for easy holstering. The front sight is also serrated, which seems out of place but hardly an obstacle to getting the Ruger LCRx into action quickly. Some concealed-carry shooters might have concerns about the exposed hammer, but except for the mild checkering on the top surface, the edges of the hammer are free of any rough surfaces that could hinder the draw. The trigger guard is generous and should present no drawbacks with extra-large fingers or when wearing gloves. The trigger face is smooth, which leads to effortless deliberate double-action shooting. Double-action pull averaged around 11 pounds while single-action pull has almost no creep and registered six pounds on the nose. Pull measurements didn’t change from brand new to after extensive firing and cleaning. The barrel is a stainless insert and measured 1.88 inches from the tip of the muzzle to the face of the cylinder. The barrel shroud itself has a bit of an inward taper as it approaches the cylinder—great for appearance, better concealment and holstering. The Hogue Tamer Monogrips are well cushioned where the web of the shooter’s hand meets the pistol, which makes shooting comfortable even with +P loads. The ejector rod is spring-loaded but regrettably pushes the spent cases out only halfway through its travel. Fortunately, the cylinder charge holes are finished smooth, so tipping the gun upward and pushing the rod allows the spent shells to exit the gun unhindered. The five-shot cylinder keeps the Ruger LCRx compact. It’s machined from high-grade stainless steel. The diameter of the cylinder at the bolt cuts measures a curt 1.28 inches, and cutouts around the periphery reduce weight. The bolt notches are machined off-center of each charge hole, adding to the strength of the entire assembly. To open the cylinder, press in on the cylinder release on the left side of the frame. I shot the Ruger LCRx over the course of a few weeks, and the timing of the cylinder stayed true, with just a hint of a drag mark around the outside of the cylinder. For help with the recoil, the Ruger LCRx is equipped with the innovative Hogue Tamer Monogrip. You’ll notice a bit of cushion at the top of the backstrap where the Ruger/Hogue logo is. 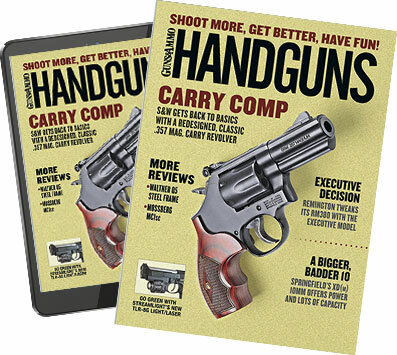 It’s a great idea because this is where the grip contacts your hand at its most vulnerable point—where high-powered defensive guns have a tendency to split your hand at this junction of the thumb and forefinger. Considering the gun, weight and the cartridge, I think both Ruger and Hogue hit more than a happy medium, and during my range time with the Ruger LCRx, I found the gun actually pleasant to shoot. The balance between the Tamer grips and the .38 Special cartridge kept recoil tolerable. Firing single action from a rest, I was able to keep groups under three inches, and after I got used to it, I was able to shoot groups as small as 1.25 inches. Shooting double-action proved quite comfortable and fun, thanks to the overall construction and the finger grooves in the grips. I was highly impressed with the Ruger LCRx, and because it offers the option of single- or double-action operation, I’d recommend it to anyone needing a gun for self-protection or field duty.